Most, if not all of us, value the kind of friendships where questions are asked. Not asking questions leads to superficial connections. 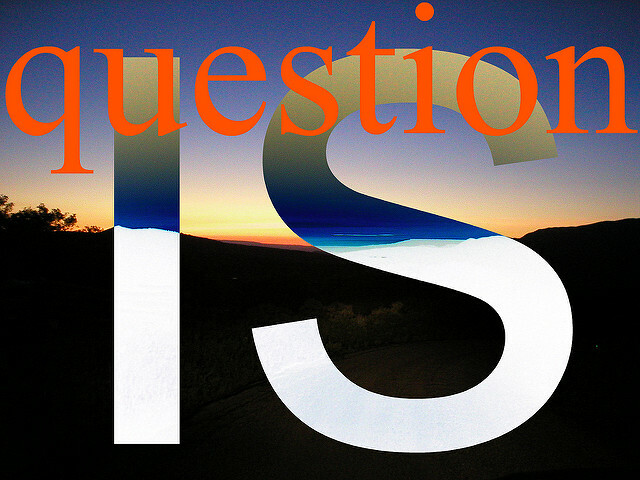 Asking purposeful questions taps the soul, and engages with the work of God. It is by asking questions that we can show interest in one another. Try going a week without asking your wife anything, and you might find your marriage going dry. Or, maybe it’s why your marriage is dry. You don’t ask questions. Several years ago Elaine and I drove two hours to visit a childhood friend of mine. The last time I’d seen Philip was in 6th grade, and probably the last thing we talked about was our latest rubber band collection. I doubted we’d begin there in our long awaited reunion. I was excited to see Philip again, and equally excited to meet his wife, Priscilla. The park was located deep in the Blue Ridge Mountains. The lost cell signal forced me to rely on the old-school skill of reading signs and occasionally referring to a map I’d downloaded and printed off the internet in anticipation of an unreliable GPS. “There it is,” Elaine gleamed, pleased she’d beat me to it. Sure enough, just feet away, to our right, a large sign welcomed us to the park we were looking for. I turned in and instructed Elaine to look for the red Mustang Philip had proudly informed me to look for. I remembered Philip for his red hair, but knew from Facebook that he was nearly as bald as I. “There he is,” I cried out. Philip stood, waving wildly and walking toward us on the road. Ten feet to his left a woman was spreading a large cloth on the picnic table. She stopped and scurried our way. I assumed it was Priscilla. After parking Elaine and I quickly stepped out of our car and bounded over to meet Philip and Priscilla. The awkward extended arms quickly turned into two men comfortably embracing each other with a strong bear hug. Elaine shrugged off Priscilla’s extended hand and gave her a warm hug. I made a quick joke about rubber bands and Philip laughed. I strolled back to my car and grabbed two lawn chairs. We all sat down and the rest of the night was, well, miserable. After two hours of enduring a oneway conversation, Elaine and I waved goodbye and took the two hours home trying to understand what had just happened. Elaine and I are deeply relational and often will discuss the nature of our connection with others, especially after a visit. We had a lot to evaluate on this trip. “What just happened, Elaine? I said with a trace of sadness. “True,” Elaine chimed. “But the moment you mentioned how Travis loved soccer, Philip took the next twenty minutes extolling how amazing his son was in soccer. We never had a chance to say anything more about our son. Elaine was right. They had asked a question, but never let me finish. We both agreed that it was unlikely we’d have much interaction with them again. I got to know a lot about them, but they discovered nothing about us. I have five very good men friends who stay regularly in touch with me. I might not talk to several of them for months, or even a year, but we remain close. I reflected recently on what makes these relationships so intimate. It’s because we ask questions of each other. Not just any question. Not mundane, surface questions, but deep questions. Soul drilling questions. Questions about marriage. What we are reading in scripture. Where we struggle. Are we staying pure? The questions tap the soul and draw us deeper into God’s work in each other’s lives. Even in our casual interaction with each other, questions can matter, and stir up an interest in what God is doing. I try as best I can, to never to ask people, “How are you?” This provokes nothing more than the perfunctory, “I’m fine!” This solicits no depth, and invites no deeper interaction. Jesus asked questions often to make a point, or to peel back layers so as to introduce truth into a now more vulnerable and open heart. We don’t ask questions just to get to know people. We ask questions in order to better understand and appreciate the work God is doing in the heart of someone else, and to participate in that work and celebrate together, with others, the depth of that work. *In part two, to be posted next week, I’ll discuss the importance of listening after we have asked questions.